Jim Jeffers, senior director and senior principal engineer for Intel’s visualization solutions, notes, “With the Intel® Rendering Framework, all the work is being done on the CPU, while users are getting the same―or better―experience than with today’s dedicated graphics hardware.” The Intel Rendering Framework provides both scalable and interactive ray tracing and OpenGL* visualization via the Intel® Embree, Intel® OSPRay, and Intel® OpenSWR libraries. Plus, the Intel Rendering Framework now includes the new Intel® Open Image Denoise library. This level of performance has redefined scientific visualization and is making significant inroads into the cinematic and professional visualization market segments (Figure 1). Jeffers points out that with its ability to exploit the available CPU memory (commonly 192 GB or more for a processor versus 16 GB for a highend GPU), the Intel Rendering Framework can deliver the same or better performance with fidelity that a GPU can’t match. That, coupled with the ability to run and visualize anywhere, regardless of the scale of the visualization task and without requiring specialized hardware for interactive response, is the reason high-performance computing (HPC) centers no longer need to procure GPUs for visualization clusters. Figure 1 – The Intel® Rendering Framework with SDVis technology supports rendering on platforms of all sizes including cloud and HPC clusters. Five years ago, you never would have heard an HPC user say, “I prefer rendering my images on CPUs.” However, that mindset changed as CPU-based interactive and photorealistic rendering supplanted GPUs in many HPC centers. Paul Navrátil, director of visualization at the Texas Advanced Computing Center (TACC), highlights TACC’s commitment by pointing out that “CPU-based SDVis will be our primary visual analysis mode on Frontera*, leveraging the Intel Rendering Framework stack.” Frontera is expected to be the fastest academic supercomputer in the U.S. when it becomes operational in 2019. As part of a U.S. Department of Energy (DOE) multi-institutional effort, and in collaboration with private companies and other national labs, Argonne National Laboratory is working to leverage the SENSEI* framework to help people prepare for the arrival of Aurora*, a new Intel-Cray system. Aurora will be capable of delivering more than an exaflop of floating-point performance. SENSEI is one example of a portable framework that enables in situ, in-transit, and traditional batch visualization workflows for analysis and scalable interactive rendering of the huge data volumes generated when using an exascale supercomputer. A big advantage of CPU-based rendering is that no special hardware is required, which means it can be used by nearly everyone on most computational hardware, from laptops and workstations to organizational clusters and leadership-class supercomputers, and even in the cloud. Interactive photorealistic ray tracing can occur on as few as eight Intel® Xeon® Scalable 8180 processors or scale to big data, high-quality rendering using in situ nodes.3,4,5,6 Jeffers notes that the interactive performance delivered by the Intel Rendering Framework, and photorealistic rendering with the freely available OSPRay library and viewer, “address the need and create the want.” Eliminating the requirement for specialized display hardware means even exabyte simulation data can be “visualized anywhere.” Users appreciate how they can view results on their laptops and switch to display walls or a fully immersive cave. The ability to run and visualize anywhere using CPUs―regardless of the scale of the visualization task and without requiring specialized hardware for interactive response―is the reason HPC users are now using CPUs for visualization tasks. The integration of the Intel Rendering Framework SDVis capabilities into the popular VisIt*7 and ParaView* viewers, along with frameworks like SENSEI*, gives everyone the ability to perform analysis and use either OpenGL rendering or create up to photoreal images. Figure 2 summarizes the advantages of software- versus hardware-defined visualization. Jeffers observes that one of the key factors driving SDVis adoption is the visual fidelity of the ray tracing. Basically, users get up to photorealism because the software is able to model the physics of light using both serial and parallel processing on the CPU, along with scalable, interactive performance. From a software perspective, the Intel Rendering Framework provides the tuned and optimized low-level operations. This is why Jeffers claims it delivers great performance to the applications developer by simply calling the rendering APIs. The scalability to run in distributed environments is also there, which has enabled the big advance in professional rendering to “interactive”8 rendering and ray tracing with full visual effects on huge, complicated data sets. 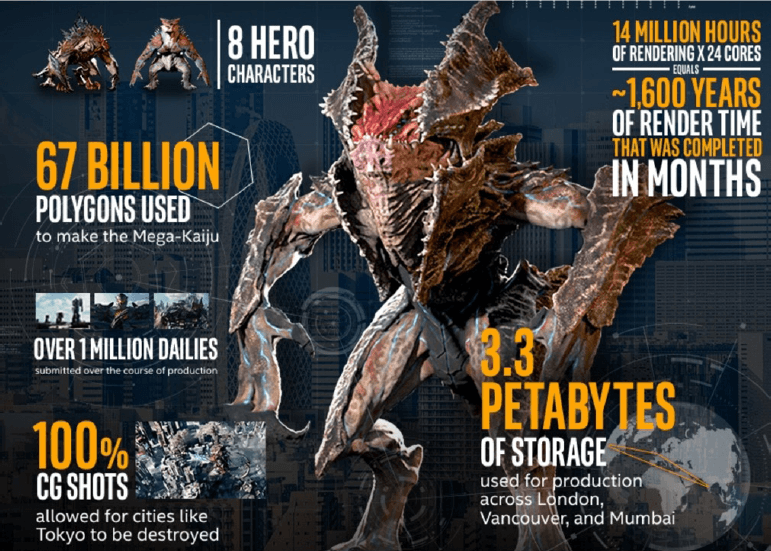 This is why movie studios run on render farms containing thousands of Intel® CPUs. Jeffers likes to point out the differences between the animation used in the three-time Academy Award* nominated 1989 film The Little Mermaid and the recent Moana image shown below to highlight the improvements enabled by ray tracing using the Intel Rendering Framework. Previously, an overnight rendering workflow would yield a few seconds of video. The 160-billion-object Moana island scene, shown in Figure 3 (recently made publicly available courtesy of Walt Disney Animation Studios to enable research and best industry practices), was rendered live using Intel OSPRay and Intel Embree ray tracing libraries along with the new Intel Open Image Denoise library. System memory capacity was important, since the rendering process consumed more than 100 GB. Figure 3 – This image containing 160 billion objects was ray traced live using the Intel Rendering Framework and the Intel Open Image Denoise Library (Image courtesy Walt Disney Animation Studios). When asked if photorealist animation will replace actors, Jeffers replied that he thinks humans are necessary to provide the emotional impact a movie demands. However, the technology may advance to the point where voice-overs and actor overlays will become more important as the visual fidelity of state-of-the-art rendering technology continues to improve. As mentioned, Intel has initiatives aside from the Intel Rendering Framework to exploit the serial and parallel performance of modern many- and multi-core Intel Xeon processors to replace dedicated hardware devices. However, the spectacular images created by the Intel Rendering Framework clearly demonstrate the appeal of CPU-based visualization. The software libraries are open-source and available for download. Users who simply wish to experience SDVis without doing any development can download the ParaView* or VisIt* applications or the recently announced OSPRay Studio viewer. Meanwhile, HPC developers can use a framework like SENSEI* to exploit in situ and in-transit visualization to run at scale. Organizations looking to experience the benefit of SDVis can look to Intel Select Solutions for Professional Visualization for verified hardware and software solutions that combine the latest Intel Xeon Scalable processors with other technologies such as Intel® Omni-Path Architecture, Intel® SSDs, and the OpenHPC cluster software stack. The Intel Open Image Denoise Library will soon become available at https://openimagedenoise.github.io/. While not the point of this article, interested readers can look to other Intel initiatives such as Intel Software Defined Networking and Intel Software Defined Infrastructure to see how Intel Xeon Scalable processors are being used to replace other dedicated pieces of hardware. Rob Farber is a global technology consultant and author with an extensive background in HPC and in developing machine learning technology that he applies at national labs and commercial organizations. Rob can be reached at info@techenablement.com. 8Interactive does not imply fluid real-time frame rates.